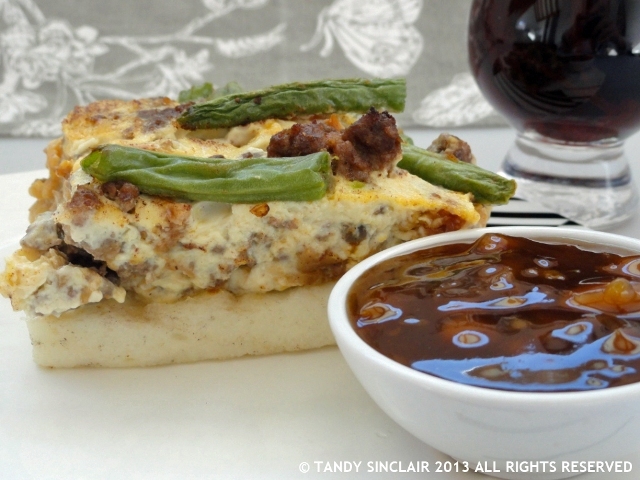 As soon as I saw the challenge theme and ingredients for round 3 of Freshly Blogged I knew I was going to make bobotie – or a version thereof, using the ostrich sausage. To me, bobotie is the quintessential South African dish, together with melk tart, koeksisters and mealie pap! Given that mealie meal was one of our ingredients I knew this was going to be a real challenge for me. I have probably tried to make mealie pap 5 times before, and it has not worked for me once. I have used various recipes to no avail. I decided that I would make mealie meal cakes, and I was so relieved when they worked out perfectly. I also braaid for the first time ever, and in a howling South Easter it was a real challenge. This dish has bites that alternate between sweet due to the dried fruit and spicy from the curry powder. Accompanied by chutney and a glass of the Drostdy-Hof Claret that I also used for cooking, the dish is warming and hearty. Disclosure: This challenge was sponsored by Drostdy-Hof for the Freshly Blogged Challenge. This post is in line with my blogging policy. Bobotie, now that brings back memories. Although we can get Ostrich meat in Calgary, it would be so convenient to buy it at the grocery shop. Oh Tandy, we were in SA las year and did not had bootie…now I must go back so I have a chance to try this dish…looks delicious, very flavorful! WOW! I have never tried Bobote or ostrich egg… I feel that I am a gourmet failure!!! It looks very delicious too! It is always interesting to learn of traditional foods from other parts of the world. Thanks Tandy for sharing your recipe. I love Bobotie and have never had it with ostrich sausage. That is really interesting. What brand of Chutney are you using? What a delightful SA recipe! I first ‘met’ the dish in its lamb version some three decades ago and it was quite my ‘party piece’ as a young married here in Australia. Recipe from the best cookery book series Time-Life ever put out! That one suggested raisins as the fruit and also had me stick fresh lemon or lime leaves into the casserole dish ere putting it into the oven. Shall have to try your version . . . thanks!! All my US foodie friends laugh: we are the supposedly ‘the sheep country’ but at least I cannot afford the ‘good cuts’ – last I looked frenched lamb cutlets were $A26/kilo at the local supermarket!! Oh my, and I thought lamb was expensive here. We also farm lamb locally and we can pay up to $A17/kilo! I object to paying that much and to make matters worse, frozen NZ lamb is cheaper – go figure? All my US friends laugh that they get ours at far cheaper prices also! I guess we have to get the ‘export coin’: oh well that too is important!! I have got around it in one way: our supermarket butchers now cut up the lamb to provide what they call ‘shoulder steaks’: at aboout $A12-14 per kilo and it is soft as butter when marinated and grilled!! Taking into a/c the local beef, pork and especially chicken prices: no way can I afford the better lamb!!! Sounds like a hearty meal! I’ve heard of bobotie but have never had it. Very cool that you used ostrich sausage! 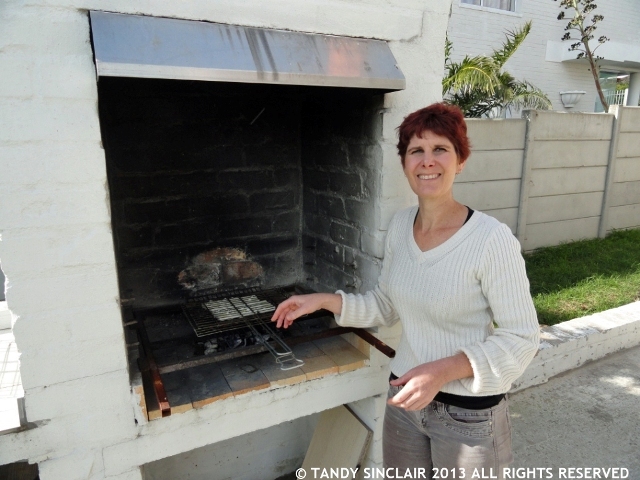 Love the idea of everything Tandy – super tasty meal. I must confess though to never having made bobotie before! Looks good and I like the sound of your mealie meal cakes. 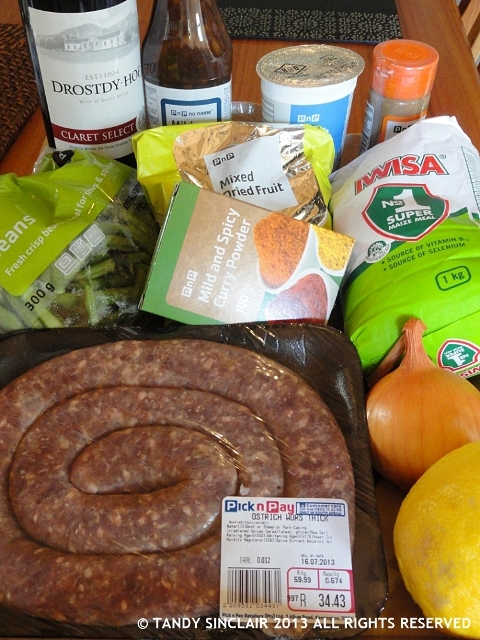 I’d also wondered about making bobotie but then I couldn’t get any ostrich sausage, so I had to go vegetarian!